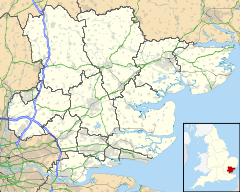 Wyatts Green is a settlement in the Brentwood borough of Essex, England. Although located in the parish of Blackmore, Hook End and Wyatts Green it is adjacent to the village of Doddinghurst. ^ Ordnance Survey: Landranger map sheet 167 Chelmsford (Harlow & Bishop’s Stortford) (Map). Ordnance Survey. 2012. ISBN 9780319232101. This page was last edited on 21 August 2018, at 10:43 (UTC).